On making a film of the moment. By this time, they’ve already made one big one by deciding to keep it, after being informed that the child has strong potential to be severely deformed, but the complications posed by the pregnancy are hardly limited to biological matters‎ in Pendharkar’s provocative drama, which places this predicament on a couple that isn’t even sure they want to be together in the first place. Anchored by strong performances from Hollyman and Arison, the film observes how many “what ifs” turn into immovable obstacles as Maya and Ronan are confronted with decisions they never thought they’d be making so soon in their relationship, if at all, buoyed by an uncommonly pragmatic perspective on what each of their choices will entail. Still, by casting such a stark light on the couple’s difficult dilemma, the sparks between Maya and Ronan during more carefree times appear to burn even brighter, creating a dynamic that feels especially fresh since Pendharkar ‎creates the space for the past and future to collide in the present as the practical demands of what could be are weighed against a romance that threw caution to the wind. Shortly before “20 Weeks” premieres at the Los Angeles Film Festival, the writer/director spoke about the real-life inspiration for the story as well as hopscotching around Los Angeles to create a film that feels as as big as the emotions of its two leads and making something that feels of the moment, both in the immediacy of its style and its connection to the larger cultural conversation. The film came about because [this] happened to me. When my daughter was in utero at 20 weeks, she was diagnosed with a serious health issue. We had to come in for testing every two weeks and had to look at sonograms and there were lots of unknowns. It was very unclear what was going to happen and it was just a very hard and stressful process and when I went through it, I thought how many other people might’ve gone through this. This touches on a situation that seems particularly timely in terms of the consideration of what agency women have regarding their own bodies. Was that something you were interested in from the start? Oh absolutely. What I didn’t want in this movie was for it to be a black-and-white issue. I absolutely believe in a woman’s right to choose and what I wanted to explore in this film is the grey area of what happens when two people get in a relationship and they have these very differing beliefs about [what they want] and the moral and ethical dilemmas that go with it. I deliberately did not use the word “abortion” in the movie because I wanted it to be a humanistic issue and not a political one, but it’s a hot button topic right now and I think people should have a right to choose. There are cases where some of the babies have very, very serious issues and to make a woman carry through the pregnancy is inhumane and wrong. Though this film occasionally moves back and forth in time, it’s done in such a way that it always feels in the present moment. How did you figure out the structure? I thought about the structure a lot and really wanted to meet this couple as we know it when they’re in love, like they’ve had this whirlwind romance and they know each other. Then I wanted that part to be a little bit more abstract so as we get into the part where it’s like wow, they’re pregnant and we learn about the journey of their pregnancy and how that all came to pass. I wanted to use their love and their relationship to take us into the present of the moral dilemma they’re going to be faced with and the challenge that they’re going to have. It’s really evocative in terms of how you use closeups. How did you figure out the shooting style for this? It was inspired [partially] by the films of the Dardenne Brothers, which use this very soft focus that feels a little like a documentary in [how] the camera’s allowed to move. We used an easy rig the whole time and I used a lot of shallow depth to keep us in the moment, keep it intimate, keep it personal and to pull us her into POV and at times, his too. But the idea was to be as intimate as it possibly could be and to make it feel like you’re really, really with them. How did you find Anna Margaret and Amir to play this couple? It wasn’t easy. The male lead is a tough part – it’s really challenging and a little dark and my producing partner Jane Kelly Kosek and I had lists. We watched a lot of independent cinema and were looking for a nice balance of cast that was kind of indie and maybe some TV actors who were looking to break out and maybe do something new or different. Anna Margaret Hollyman had come up a lot because she’s been the lead in a number of independent films and I had a connection to her through someone I work with at Loyola, who had shot a film with her in it. They’d won a big award at SXSW, so I thought maybe she’d be interested, and she was, and she’s just an amazing dramatic actress. Then Amir Arison [came] through watching television. He’s on NBC’s “Blacklist” and was looking to expand his work as an actor and an artist. Talking through people in the circles that I know, we reached out to him and he really gave this all he had. We did 20 hours of Skype calls before we shot and we spent a lot of time really fleshing out the character and creating a life for these characters that felt very authentic. Did the two of them get to spend a lot of time together before this or were they thrown right in with each other? They were thrown pretty much right into it, so… yeah, they were pretty incredible. We stacked the shoot so that the intense scenes were much later in the movie, and we kept the scenes that were a little less intimate and [less] stressful much earlier, so they could build it up and get to know one another. They did spend a lot of time together getting to know one another as the shoot went on. You really make the most of Los Angeles as well. What was it like to shoot all over the city? It was really hard. [laughs] I don’t know if I’d do that again. When we were breaking this down, we had all these complicated locations and time periods and it was pretty challenging. The one thing that is nice is I teach filmmaking at Loyola Marymount University and they were really kind and generous in letting me use some spaces there, so I was able to double up to make a doctor’s office and the outdoor bluff and stacking some locations so that we could shoot those out. We also shot in Echo Park for the [couple’s] house, and [when we were shooting] on the street, it was a bit challenging. There were some vendors or store owners that didn’t really want us there and we had it all permitted, so they tried to kick us out and called the cops, but when the cops came, they said, “This film has a right to be here,” so we got through it. Obviously on an indie budget, you don’t have the money to shut down the street, so we had to work with the elements that were there. Even filming in the baby store [in Sherman Oaks], they let us do it, but we didn’t shut down the store completely, so it was a little nutty shooting in public spaces. I used my own house for the party scenes, which was definitely an undertaking, but we had a great crew and we were really able to pull it off. Having made a previous feature, what was it like making a second? I hadn’t done a feature for a while. I was just focusing on shorts and things that were a little bit more doable, but I think I was a little scared after my first experience making a feature [on “Raspberry Magic”]. Honestly, it’s difficult and it’s [particularly] challenging as a female director to get these kinds of topics out there and really give them the attention that they need. My first film was [also] about a young girl whose family abandoned her and she has to take charge when her parents fall into depression. But I was really determined to do it and the nice thing is that my producing partner, my [cinematographer] and I have done a bunch of other things together, so we knew each other really well and we knew how to do things and do them really fast. Sometimes we had three scenes in one day and I was able to really just focus and make it happen, and having Anna Margaret and Amir there made it great. They were so professional. I could run three or four takes and then just move on. It was fast. Are you excited for the premiere at L.A. Film Fest? I’m so excited to premiere at LAFF. It’s such an opportunity. When I first came to L.A., I would go to the festival every year and watch all their movies. Then I was in their diversity fellowship and their screenwriting lab, which was taught by Meg LaFauve, who is a writer for Pixar movies now, and two of the women that were in my class were Ana Lily Amirpour, who has gone on to be a pretty big director, and Tina Mabry, who has also gone on to be a big TV director, so I think Film Independent does an awesome job of fostering talent in L.A. and I feel really fortunate to be playing at their festival. 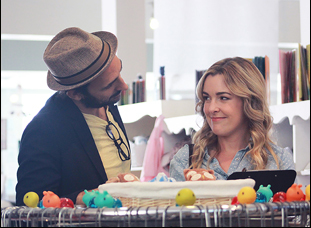 “20 Weeks” opens on April 13th in limited release, including at Los Angeles at the Laemmle Music Hall. L.A. Film Fest '17 Review: Vincent Grashaw Powerfully Opens Up a Conversation on School Violence with "And Then I Go"